Focusing on the classroom environment is important in engaging students. It tells them what is valued, what is important in learning and it will certainly set a tone for learning. As I return to my classroom I am reflecting on what has worked and what hasn’t and other ways I can give students opportunities to learn new things. 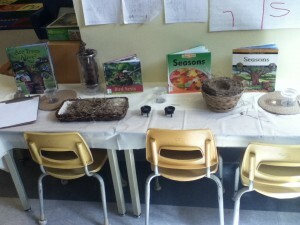 For example, more computer access to seek information on our inquiry projects, adding mirrors to our light table area, looking at my shelving space and how I can organized various materials to make things more appealing to my students, and creating more centres of inquiry. With all this happening, how can I better assess my students through documentation. I created a new form that my ECE partner and I can track conversations in a more organized fashion and we can simply slip the forms into portfolios as opposed to always typing the information out. I also gathered more clipboards to have at each station and labelled these as our documentation boards. 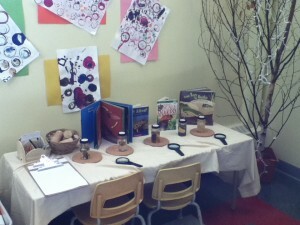 Here are a few photos of centre idea where children can be creative. This is a great little centre that focuses around found materials. Students can develop their fine motor skills in connection to math or art. The mats are earth tone in colour and are used as a different surface for children to create. This centre idea uses material found at the dollar store. 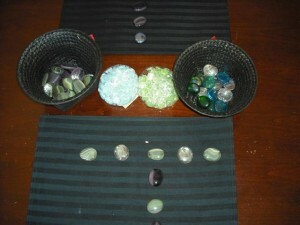 There are jewels and stones of different colours that you can place in different baskets sorted by colour/shapes/size its up to you. You can use placemats, black felt, photo frames that students can use to display their different art pieces. Again, you can connect to math and a great oral language opportunity for the children. Here are some pictures of one environment http://earlylearningcentral.ca/?page_id=2138 to get you thinking about your space. Reflective Questions: What do you do when the environment is not working for your students? How can you place materials that will engage student learning? How can I document student learning and display it? As a parent to a first time JK student, I found myself asking him question after question once he got home today. At first he answered I don’t know and later he shared more about his day. As a teacher to new students in a new enviroment an idea would be to send home a little information about their first week. On a piece of paper create some simple sentences like; I played with ________, I played at the _______ centre. Then, let them illustrate a picture on their own about something they enjoyed. You can call them over in small groups, you can circulate around the room and engage in oral conversation while recording their ideas during play. When time allows you can take a photo and send it home . This way they can talk at home about things they actually did! is the centre set up to be child-directed, or will you have to be involved at all times? Before school starts, educators go in to their classrooms to set up the environment. Making a list of the centres you want in your classroom is a good place to start. Then, you can look at the classroom and see where each centre you want will fit, and if it will work in your room. Think about where you will need space for large group instruction times, and where in your room will suit small group activities. Also, think about which centres will require a quiet area, such as a reading/book centre, and try to avoid putting those centres next to a centre that can become busy/noisy, such as a dramatic play centre. The furniture that you will need for your centres will also need to be taken into account when setting up your classroom. Once the first day of school arrives, explain the centres briefly to the students. Take them on a tour of the classroom so they can see what is available for them to play with. When the children are engaged at the centres, circulate so that you can spend a few minutes with each child and get to know them a little bit and discover their individual interests. This can also give you some insight into adjusts you may want to make to centres. You can also model for children while you spend time at each centre.